This is final year project for Control Engineering students on "automatic bottle filing system using PLC and conveyor belt". For this project Omron CPM2A PLC is used, which act as heart of the system and is programmed using Ladder programming. During this project sensor has been used to detect the bottle position that move along the conveyor belt at the low speed while the machine operates. The input signal that has been sent from the sensor to the PLC has being made as a reference. Signal in order to determine the output signal that exactly a same with the PLC programming language based on the user requirement. You can also Subscribe to FINAL YEAR PROJECT'S by Email for more such projects and seminar. The prototype was mainly built by combining the mechanical design and the electrical designs. The system require three external DC power supply for input output devices, two AC power supply for supplying pump and PLC, and one 9V battery for buzzer. 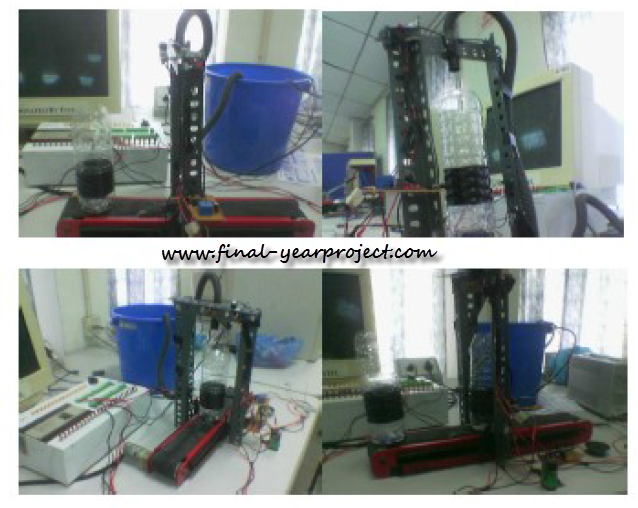 This report consist ladder programming, flow chart, block diagram used, prototype of the project, conveyor system, electrical design etc. to help you in making your project. Please treat this report as reference material for your final year project.